Podcasting may be a great way to make your voice heard, but no one would call the process of recording, editing, and posting a podcast simple. Consider blogging for a moment—at its essence, all that activity requires is launching blog software, typing, and posting. In contrast, creating a podcast is a multi-step process that involves some know-how. Even those of us who podcast regularly would welcome a way to simplify the whole process. Apple hopes to bring that kind of simplicity to podcasting with GarageBand 3. You could always use the music composition program to record and edit audio for use in a podcast. But the latest version of the software adds features specifically aimed at podcasters, with Apple suggesting that these changes make it easier than ever to create a professional-sounding audio program from within GarageBand. But do they? As an experiment, I decided to create a version of the Macworld Podcast using only the podcasting capabilities featured in GarageBand 3. What I found after a day of recording is a solid entry-point into the world of podcasting, even with some features that don’t quite work as advertised. When you launch GarageBand 3, you’ll notice the prominent role podcasting now plays in the program. There’s a New Podcast Episode button on the main page, directly beneath the New Music Project button. Click the podcast button, and you’ll be asked to name your podcast. Next, GarageBand presents you with a blank mixing screen that defaults to four audio tracks along with a “Podcast Track” on top. This track isn’t for mixing audio; rather it’s for entering artwork, creating chapters (with accompanying artwork and URLs), and adding Title, Artist, and Description tags. The Podcast track is also where iChat icons and screen captures can go. You can pull in these images from the iLife Media Browser, but you’re not necessarily limited to there—you can drag images onto podcast track from folders on your Desktop, for example. And when you do that, GarageBand will automatically create chapters. You can link visuals to specific audio sections. And if you end up deciding to move audio tracks and want their accompanying visuals to move with them, just Shift-click each track to select them and drag them to their final destination. 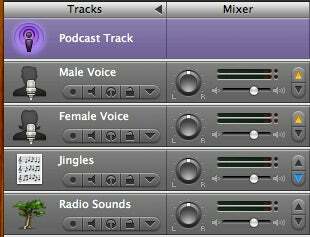 The four default audio tracks are called Male Voice, Female Voice, Jingles and Radio Sounds. Those first two tracks have pre-assigned effects that bring out the character of a male or female voice. A woman could certainly record on the Male Voice track, but Apple designed specific effects for that track to sound best with certain vocal timbres—thus, the gender-specific Track Names. To change the order or name of the tracks, simply drag them around to your heart’s content. If you don’t need that many tracks, just delete the extra ones by going to the Track menu and selecting Delete Track (or selecting the track and pressing Command-Delete). You’ll obviously need something for capturing audio into your Mac. You can pick up an inexpensive microphone down at your local electronics store. Other input-device makers sell all-in-one headphone-microphone headsets, like the Logitech Premium USB Headset 350 (my microphone of choice). Both currently-shipping laptop models, the iBook and PowerBook, have built-in mics. You could even use the microphone that’s built into an iSight, if you happen to have one of the video-messaging cameras on hand. Be aware that if you do use an iSight attached to a desktop computer, the distance between the microphone and your mouth will probably be farther away than you’d like—and that will affect the quality of your recording. Whatever recording tool you decide to use, you’ll want to find a quiet time and place in your home for recording. That will isolate the sound of your voice, which will improve the clarity of your podcast. Now that you’re ready to record, go to the GarageBand menu, select Preferences: Audio/MIDI, and select the appropriate devices from the Audio Input and Audio Output pop-up menus. For the podcast I recorded with GarageBand, I selected my Logitech headset for both input and output. To record, you have to enable the track that you want to record by clicking the red recording button under the name of the track. Then click the main Record button below the main mix window, and start talking. Once you’ve got your voice tracks laid down, you probably want to put some introductory music down underneath your voice. During his Macworld Expo keynote demonstration of GarageBand 3, Steve Jobs showcased a new feature in the application called ducking—where a backing audio track is automatically lowered so that a lead track can be heard clearly above the background music or sound effects. Ducking is enabled by default in the Control menu. You can select which tracks to duck by clicking the up and down arrows that appear in each track’s Mixer pane. When the down arrow is selected, GarageBand will treat it as a backing track to be lowered. Any tracks with the up arrow selected will be considered lead tracks, which will be heard above the ducked backing tracks. GarageBand 3’s ducking feature isn’t without its flaws. The application won’t let you control how quickly the backing track ducks and recovers—it ducks pretty abruptly and takes a second or two to come back up once the lead track goes silent. Nor are the volume changes created by the ducking feature visible in the Track Volume sub-track, which can be enabled by pressing the up arrow just below the track name. This Volume Track control lets you manually alter the volume of the track through the use of points on a volume curve. Using this volume curve you can create more precise ducking than what GarageBand automatically offers. When I’m editing a Macworld Podcast, I like to have the introductory music rise, plateau, and then drop again. I tried it in GarageBand, first with ducking enabled, but the effect didn’t sound right to me. I also didn’t like that I couldn’t see how much or how fast the change was occurring. Still, first-time users may not have that problem. In fact, automatic ducking might even make things simpler if you’re a novice podcaster, since you won’t have to worry about volume curves. However, if you find that the auto-ducking doesn’t sound quite how you want, you may wind up doing what I did—turn the feature off and draw your own volume curves by clicking on the volume line and dragging it up and down as you see fit. GarageBand 3 adds some nice goodies for podcasters in the form of an extensive library of royalty-free music and jingles. Specifically, the software offers more than 200 sounds and 100 jingles (variations of which push the jingle count past the 200 mark). Incorporating interviews from Apple’s iChat messaging software is quite easy with GarageBand 3. Just make sure the person on the other end is using iChat as well. Start an audio or video chat by inviting that person to a chat (or just click the green photo or video icon by their name). If you do this while GarageBand is open, the music app GarageBand will ask you if you want to record the chat. You might run into some quirks when you first experiment with this feature. I tried recording a chat with my colleague Jonathan Seff, but I couldn’t get his voice to record—only my voice was getting picked up in GarageBand. Christopher Breen, who reviewed GarageBand 3 for Macworld , suggested restarting both GarageBand and iChat—after that, iChat recording worked like a charm. GarageBand has strengths in other areas, particularly when it comes to quick exporting. You can export your work as an AAC file by choosing GarageBand: Preferences: Export, enabling the Save to Disk option, closing the Preferences window and then choosing Share: Export as Podcast. If, for the sake of compatibility, you may want to save your podcast as an MP3 file, choose Share: Send Song to iTunes, and then convert the AAC file to an MP3 file. Regrettably, GarageBand doesn’t offer you the option to directly save your file in the MP3 format. But how does a GarageBand podcast sound? Go to our Macworld Podcast weblog and listen for yourself. The new podcasting features lead the parade of changes in GarageBand. But they aren’t the only additions worth noting. GarageBand 3 features a new Video track where you can put iMovie footage. Having the video right in the application makes it easier to create a score for your movie, whether from your own composition or from the program’s included loops. You can also use the audio tracks in GarageBand to add sound effects to match the footage in the Video track. The new version also adds an online sharing component. Say you want to collaborate with other musicians over the Internet. Instead of sending a bulky music file, GarageBand 3 lets you compact song recordings for faster uploads and downloads. Despite some shortcomings, GarageBand 3’s podcasting features make it a robust and versatile audio editing program. Some podcasters have been using it for more than a year, such as Dawn Miceli and Drew Domkus of the Dawn and Drew Show —and that was before the latest changes to the application. GarageBand’s multi-track layout makes it easy to add music, sound effects and voices to your podcast as needed. The presence of some basic audio functions, such as a simplified approach to ducking and quick exporting, can make it easy for anyone to start their own podcast. All in all, GarageBand is a great entry point to the world of podcasting and takes some of the mystery out of a complex process. Mac users interested in getting their start with podcasting will want to give it a try. And more experienced podcasters might find the new features to their liking. 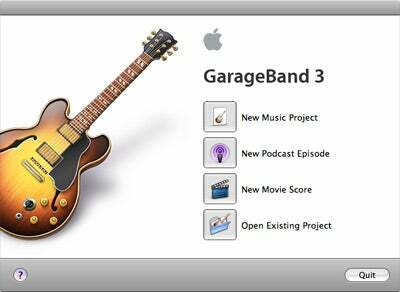 This story, "First Look: First Look: GarageBand 3" was originally published by PCWorld.